Instead of the forests and mountains that are common to Colorado, the Northeast Region is flat, wide-open grasslands and expanses of golden wheat. Some refer to it as "Colorado's Outback". During the days when gold-seekers swarmed the Colorado hills, homesteaders moved to these prairies and built communities that still evidence the past in antique buildings and abandoned settlements. Lakes and reservoirs offer water recreation, and the hunting is good for antelope, deer and game fowl. 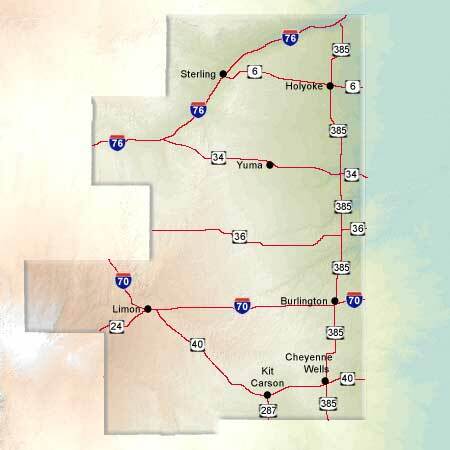 The largest city in the region is Sterling, with a population of 11,278. Between April and October the Northeast Region hosts over 150 events, including fairs, rodeos and other celebrations.